A Virginia Beach, Va., mother was stunned this week when she says she found boxes of ammunition in her son’s Toys “R” Us package. 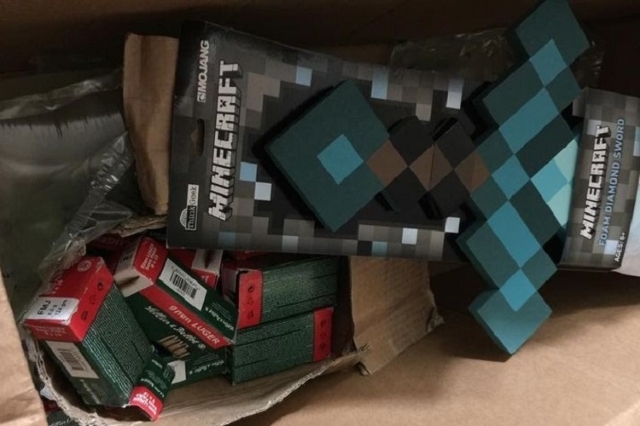 Jasemin Stephenson told USA Today she ordered a foam sword from the game “Minecraft” from the store’s website last week. When the package arrived, she said she found 800 rounds of 9mm ammunition in the box with the toy. “It is very shocking. You are ordering from a Toys “R” Us store, you don’t expect to get ammo in a box of toys,” Stephenson said. In an email, Toys “R” Us spokeswoman Kathleen Waugh said the company is looking into the incident.